Good decoration comes from design and execution, not quantity and complexity. 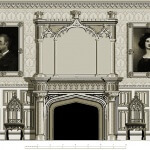 Renewed interest in historical decoration has meant more clients looking to recreate classical styles of ornamentation, whether a Gothic mansion, a French paneled dining room, or an English Georgian bedroom. The challenge is to deliver the highest-possible craftsmanship while keeping within budget. 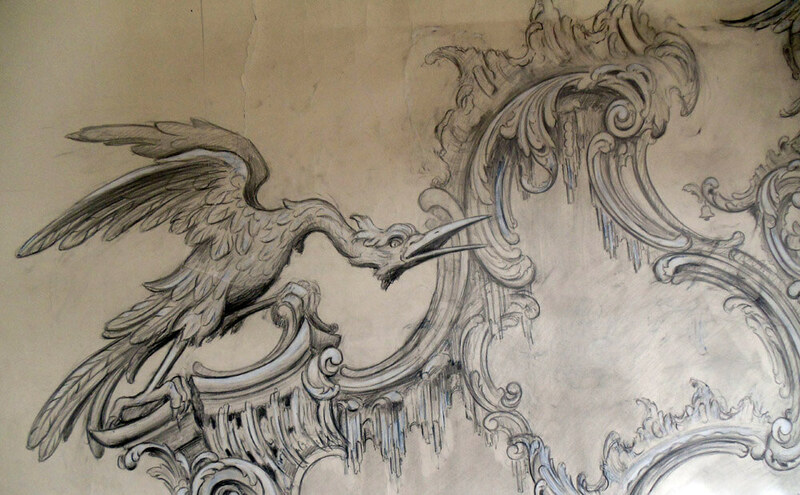 Rococo-style woodcarving rendered in pencil, charcoal, and chalk by Adam Thorpe for Agrell Architectural Carving. 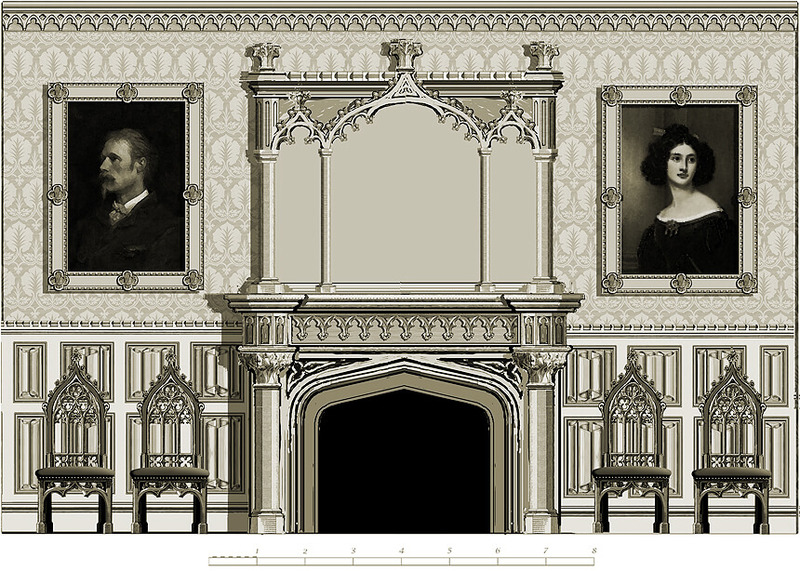 We can create designs for entire rooms that are historically accurate. Often a client might request two or more design alternatives. Our decades of experience in handling ornamentation projects have taught us that involving us early in the design process will save you time and money. How? We can provide design alternatives for your clients and other viable solutions for addressing costs without compromising quality. We can also produce detailed renderings to present to your clients to help them realize their dreams. 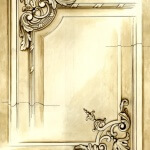 We also provide carving samples that are historically and stylistically accurate. 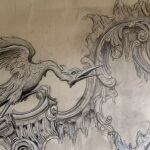 Successful ornamentation comes from good design and execution, not quantity and complexity. If your budget is tight, we recommend simplifying the design or placing ornamentation only in the areas that really matter, such as the fire surround and door casing. That way we can meet your budget without sacrificing our high level of workmanship. Well-designed and perfectly executed decoration will withstand scrutiny for centuries to come. Quality always stands out, and you will never regret your decision. 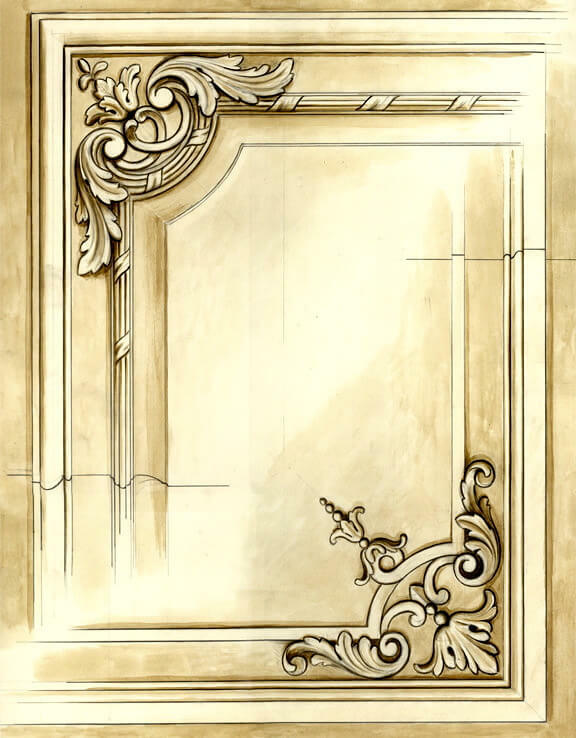 For those wishing to recreate historical woodwork or who are adding woodcarving to an existing historical space, we offer a design consultation service that is unparalleled in its expertise of all period styles. For example, we recently recreated the carved woodwork for Bishop Sherlock’s 18th-century room in London’s Fulham Palace. The entire first phase of the project, of which Bishop Sherlock’s Room was an integral part, was awarded First Place in the Conservation category for the Royal Institute of Chartered Surveyors (RICS) London Awards in 2008. The project was highly praised for its harmonious blend of sustainability, usability, and affordability. We offer access to our extensive collection of more than 3000 images so you can quickly present ideas to your clients. Visit www.ornapedia.org to access this library. We can also provide prices based on all of these images.